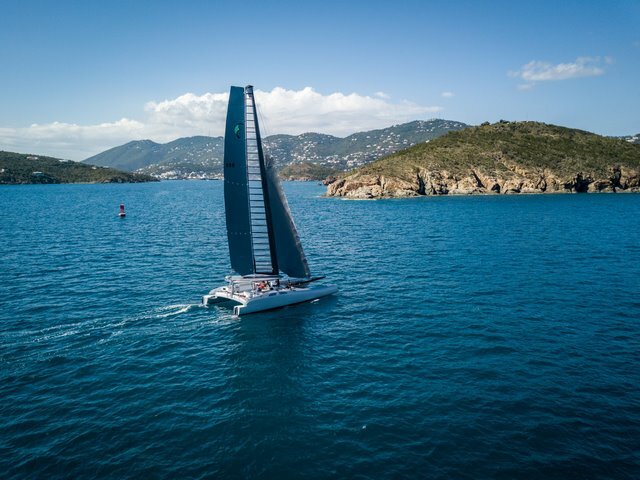 The Eagle Class 53 sailed for the first time with its Hybrid wing and jib in a gentle 8 knots of breeze on flat water off the island of St Thomas in the USVI recently. A project that began four years ago has now come to fruition for Tommy Gonzalez of Fast Forward Composites. 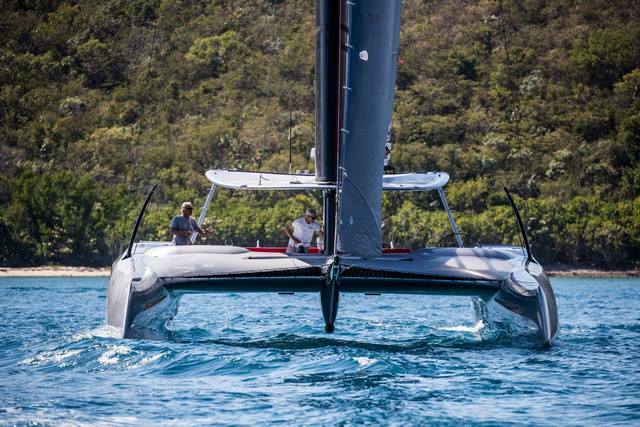 They have produced the most revolutionary catamaran in the world. 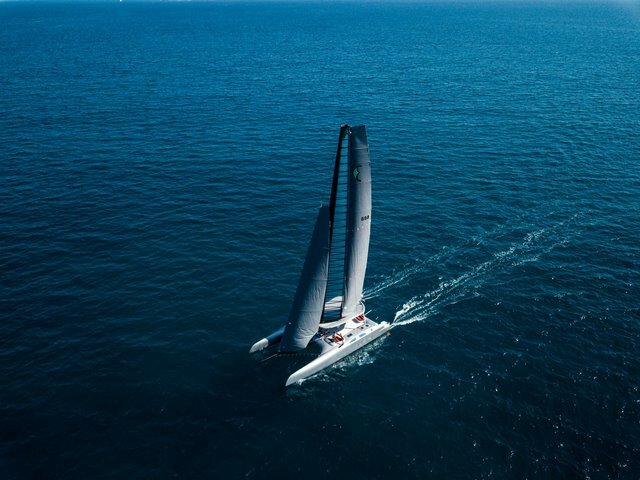 The boat was conceived by professional sailors and designed by an international team of designers, engineers and naval architects. Only three crew sailed including Tommy Gonzalez and Randy Smyth, both of whom were elated with how well the sail went, and they were joined by the new crew Amber Bowman. The day started at 4am to step the rig, and in the afternoon breeze they sailed for the first time with wing and main plus jib. The Hybrid Wing will stay in place thanks to its revolutionary ability to feather through 360 degrees when the boat is moored or docked. In the 8 knot light breeze they achieved speeds of 10 and 11 knots. this will happen over the coming few weeks. Images of progress will be regularly posted on the Eagle Class 53 Instagram, (CLICKY). “It was a great push, got out a lot of kinks, learned a lot, she glides and moves effortlessly across the water so were very happy. It was easier than we thought. 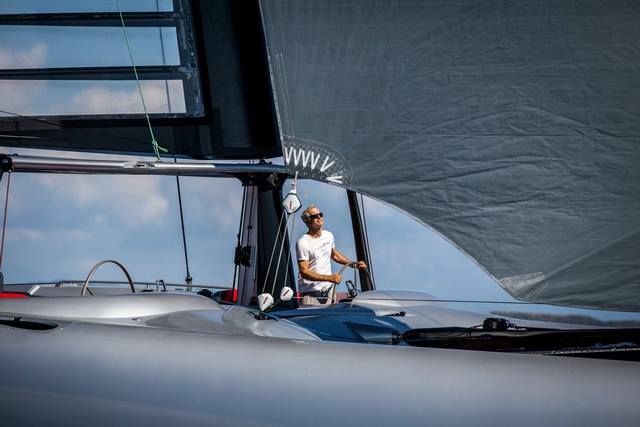 "Once we’re fully comfortable and up to speed with the Hybrid Wing and C-foils, we will be fitting our T-foils for full foiling” added Gonzalez. A smiling Randy Smyth also added…. “Today was a big day. We’ve waited years for this. The Fast Forward Eagle Class 53 finally hit the water, the wing up and all the sails up. It was a fabulous day with only three of s out there. It was like a dream come true”.